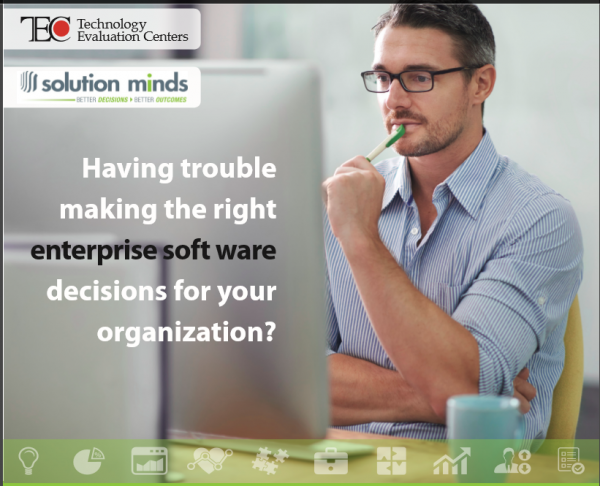 Having trouble making the right ERP or Enterprise Software decisions for your organisation? At the heart of Solution Minds’ extensive enterprise software research capabilities, decision-making methodology and expertise is TEC Advisor, an online decision support application that will kick-start a simplified selection process and will cut through the hype and confusion that software providers use to sell you their products. Whether you are looking to benchmark your existing solution against other solutions in the marketplace or fully assess your options for a future software acquisition, TEC Advisor will bring expediency, transparency, and objectivity to your decision-making process.